Spirit Guardian is popular for its crisp 3D graphics, strategic battles, and feature-rich content. Endless Dream, Resource Run, World Boss, Element Rush as well as Dream Treasure have brought so much fun for the battlers in Spirit Guardian. The new game mode has brought fans challenge and fun at the same time with its monopoly-style play. 1）Unlocked at level 42, explore mysterious lands to uncover a large amount of treasures! 2）Roll dice to determine your movements on the map. You will explore the grids you land on, which can be anything from treasures chests to bosses to battle! 3）Players get free attempts to explore each day, but can also purchase more attempts. There are a limit to how much you can explore per day. Attempts will restore daily at 3AM server time. Tyrant: The destroyer during the journey of Treasure Raider, defeating the Tyrant can get a large amount of exploration scores, of course, you can dodge it. 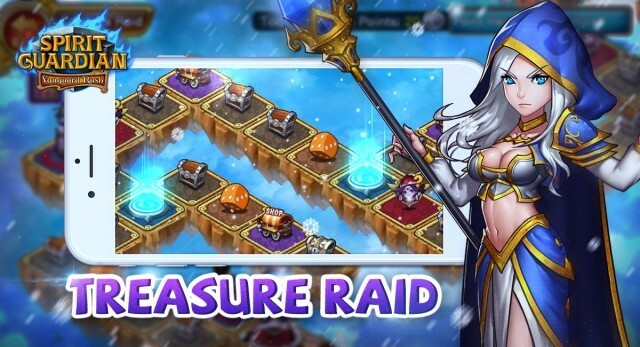 There are Endless treasures awaiting you to discover in the new Treasure Raider! Become a master explorer and unlock all the mysteries of this new mode!